Greeted by formidable two-story columns and impeccably manicured lawns, this Hancock Park hideaway flawlessly blends traditional charm with modern comforts and ultimate privacy. Attention to detail and contemporary finishes have tastefully restored this 1932 Colonial Revival to its original glory. The striking four-bedroom, four-bathroom offers an elegant yet comfortable Southern California lifestyle with its open floor plan and abundance of natural light throughout. Appointed with wonderful period details including walls lined with wainscoting, dark hardwood floors, and windows that frame beautiful, mature landscaping. Entertain guests in the gracious living room with views of greenery at every turn and a fireplace at its center. The chef’s kitchen opens to a cheerful, bright family room with the most stunning formal dining room on the opposing end and leads to the downstairs office/guest bedroom. The beautifully sun-drenched master suite boasts a sumptuous walk-in closet and a resort-style master bath. Two guest bedrooms with views of the Wilshire Country Club golf course complete the upstairs space. Outside, a swimming pool, grassy lawns and multiple lounge and entertainment spaces designed with alfresco dining in mind perfectly compliment the expansive, hedged and private backyard. An entertainer’s paradise, this modern colonial retreat is an absolute gem. This property is located in the Hancock Park neighborhood, which was developed in the 1920s by the Hancock family, who earned their profits from oil drilling. Today it is comprised of grandly designed commercial buildings and strikingly beautiful homes. From acclaimed museums to areas of culture, Hancock Park continues to be one of the most highly desirable areas to live in Los Angeles. Not only is there value in your home with the average sale price being $790 per sq. ft. but the close proximity you are to Larchmont and West Hollywood. What makes the location of this property even better is that it is moments from Larchmont Village, a quaint old-town shopping street in Los Angeles. 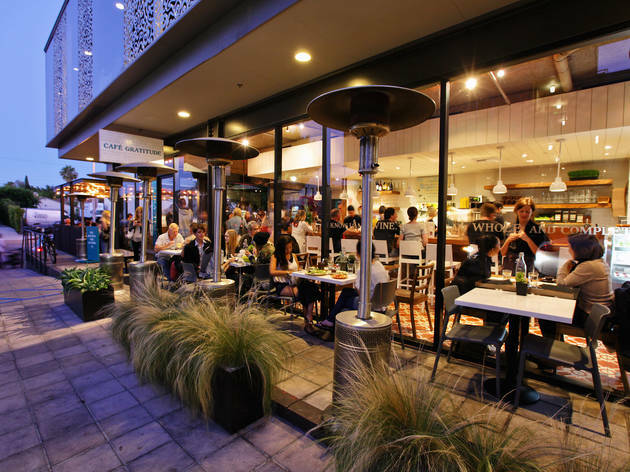 Check out the list below of our favorite eateries in Larchmont and Larchmont Village. Spend your Sunday mornings from 9:00am to 1:00 pm stocking up on fresh produce for the week at the Larchmont Village Farmers Market. Come shop local where you will find vendors selling fruits, vegetables, pastries, flowers, and more. I scream, you scream, we all scream for ice cream! There is nothing better on a hot day then eating ice cream, especially at Salt & Straw. This small ice cream chain is truly inventive when it comes to their ice cream flavors changing their menu every month. One can find flavors such as Amaro Candied Herb Seeds to Chocolate Date Shake, and just to name a few. But do not worry you can find all your classic favorites and even non-dairy options as well. Experience one of the greatest plant-based restaurants in Los Angeles. This collection of restaurants specializes in gourmet cuisine from breakfast to dinner and all meals in between. From acai bowls, to kale Caesar salads, to black bean burgers you will not be able to taste that your meal is solely plant based. There is truly a dish on the menu for everyone, even the pickiest of eaters. This family owned shop provides a great assortment of fine wines from the around the world, to artisanal specialty foods, to a full deli service, to fresh baked breads. Imported oils, vinegars, chocolates, caviar, and teas, and much more fill the shelves. This is the perfect place to grab quality products for your next dinner party or lunch on the beach. 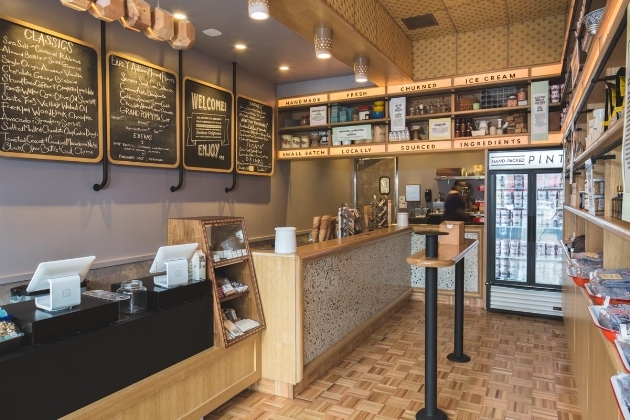 Grab a coffee, tea, or baked good on the go or sit down at the counter for a hot or cold breakfast meal at this popular Larchmont coffee shop. From granola, to waffles, to eggs served in a variety of ways Go Get Em Tiger is just the place to start of your day. Be sure to check out our listing during our next open house Sunday, October 7th, from 2-5PM!